For all your note taking needs! Microperforated sheets provide a clean, easy tear. Ruled lines encourage neat writing. Pad Type: Notebook; Sheet Size: 10 1/2" x 8"; Ruling: Wide; Number of Sheets per Pad: 70. For all your note taking needs! Microperforated sheets provide a clean, easy tear. Ruled lines encourage neat writing. 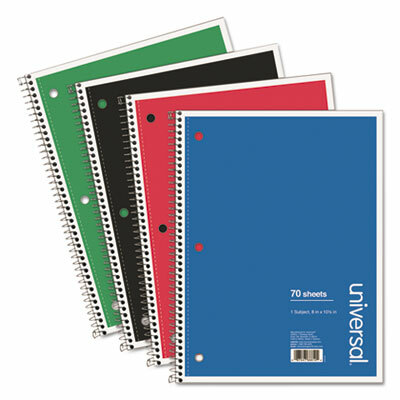 Pad Type: Notebook; Sheet Size: 10 1/2" x 8"; Ruling: College; Number of Sheets per Pad: 70. 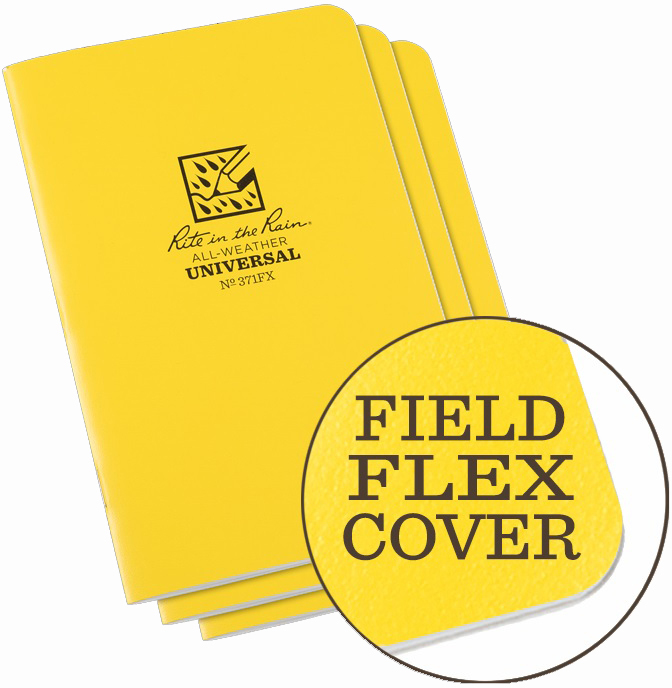 Monthly planner with a durable hard cover that folds over to create a sturdy writing surface. 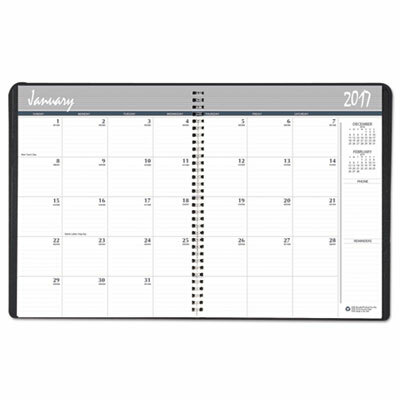 The planner is bound strongly with wire binding to withstand daily use throughout the year. Includes numbered weeks for easy documentation and Julian dates with days remaining. Space for phone messages and reminders. Includes 30 memo pages. One month per two-page spread. This product was made using wood sourced from a certified managed forest. Size: 6 7/8 x 8 3/4; Page Color/Theme: Blue; Appointment Ruling: Open Scheduling; Edition Year: 2016-2018. For all your note taking needs! Microperforated sheets provide a clean, easy tear. Ruled lines encourage neat writing. Pad Type: Notebook; Sheet Size: 9 1/2" x 6"; Ruling: College; Number of Sheets per Pad: 120. Classic notebook is designed for filing with an interior folder. Crisp, high-white, Optik Paper� delivers a superior writing experience with minimal ink bleed for clear notes on both sides of the page. Perforated sheets designed for clean removal. Ruled sheets help keep handwriting neat and orderly. Interior three-flap folder provides convenient and secure storage for printouts, digital files and more. Sturdy wirebound notebook with durable black poly covers. 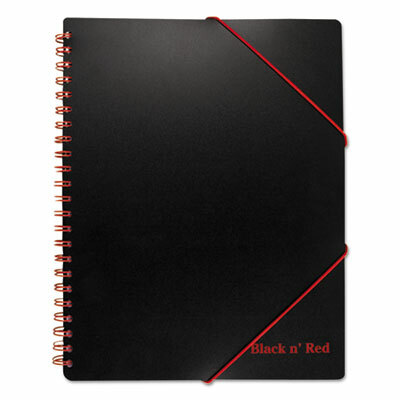 Handy red corner bungee closure keeps all items neatly inside the notebook. Pad Type: Notebook; Sheet Size: 11 5/8" x 8 1/4"; Ruling: Legal; Number of Sheets per Pad: 80. We have a list pad for every mood. 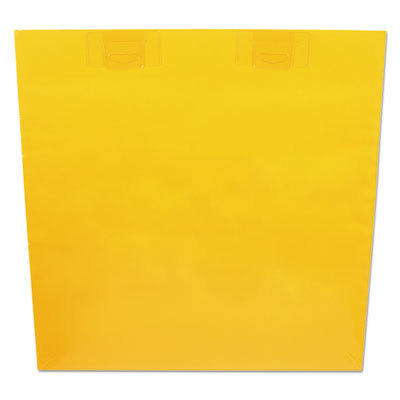 Each shopping list pad has a durable magnet strip securred on the back for easy refrigerator or metal cabinet application. Convenient Accents business notebook is a smart choice for organizing notes and project planning. Ruled, double-sided notebook pages keep handwriting aligned so notes are neat and easy to read. features ruled pages with date box. Date box at the top of each sheet allows to keep notes organized by date for future reference. Repositionable page divider, poly pocket and pen loop included. Notebook features concealed wire binding; spine is covered with faux leather for a smooth finish. 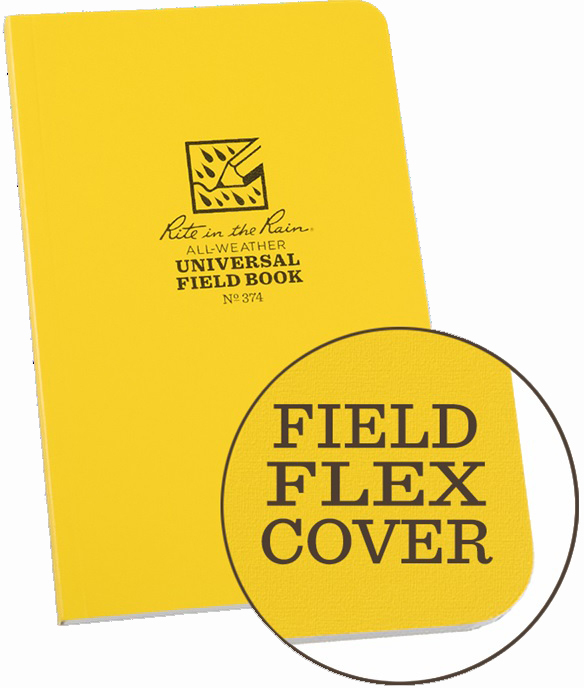 Poly notebook covers are durable to protect notes and pages stay secure with bungee closure. Pages are perforated for clean and easy removal. Pad Type: Notebook; Sheet Size: 11" x 9"; Ruling: Legal; Number of Sheets per Pad: 100. Convenient Accents business notebook is a smart choice for organizing notes and project planning. 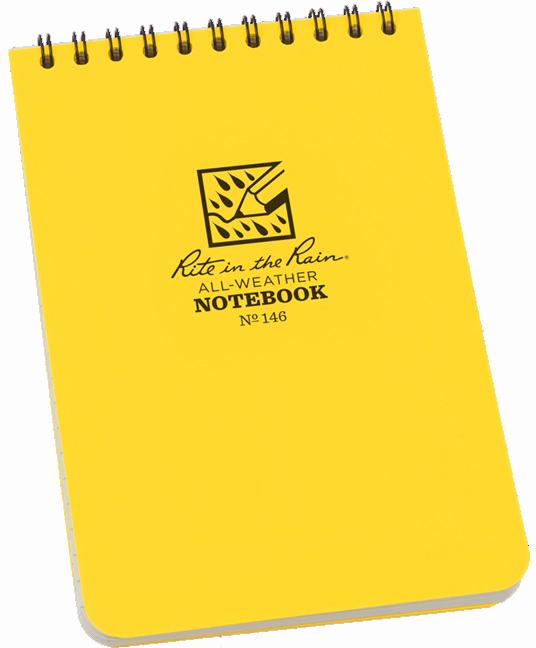 Ruled, double-sided notebook pages keep handwriting aligned so notes are neat and easy to read. features ruled pages with date box. Date box at the top of each sheet allows to keep notes organized by date for future reference. Repositionable page divider, poly pocket and pen loop included. Notebook features concealed wire binding; spine is covered with faux leather for a smooth finish. 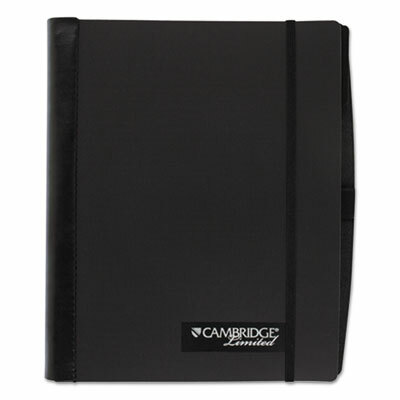 Poly notebook covers are durable to protect notes and pages stay secure with bungee closure. Pages are perforated for clean and easy removal. Pad Type: Notebook; Sheet Size: 9" x 6"; Ruling: Legal; Number of Sheets per Pad: 100. Movable plastic pocket dividers with color-coded tabs are visible through die-cut in front cover. Spiral Guard� comfort grip prevents snags. Durable plastic cover. 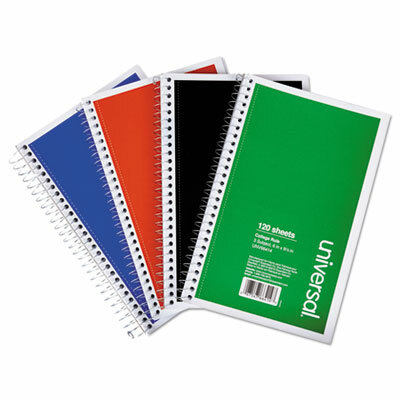 Includes pencil loop on front cover and writable label on Spiral Guard�. Two pockets. Pad Type: Notebook; Sheet Size: 8 1/2" x 11"; Ruling: College; Number of Sheets per Pad: 100. This beautiful boxed set includes 8- 3.5 X 5 inch notecards with detailed color illustrations, each blank inside, printed on quality recycled paper, plus envelopes, all packaged in a mylar gift box. 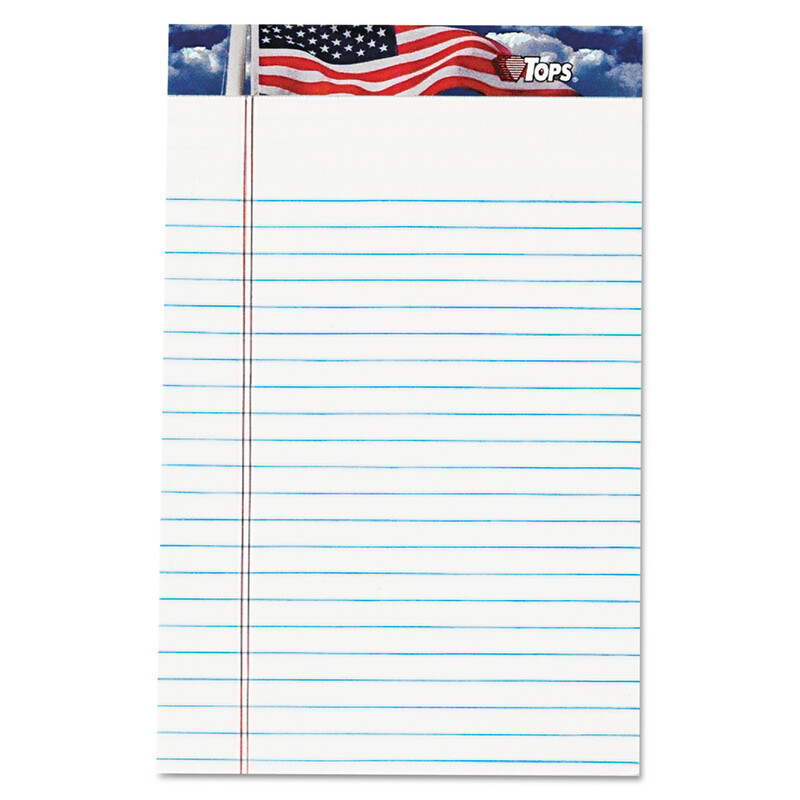 American Pride� writing pad displays the nation's colors on a blue-sky background printed on the binding strip at the top. Letr-Trim� perforation for clean and easy sheet removal. Heavyweight 16-lb. paper resists bleed-through. Pad Type: Notebook; Sheet Size: 8 1/2" x 11 3/4"; Ruling: Legal/Wide; Number of Sheets per Pad: 50. 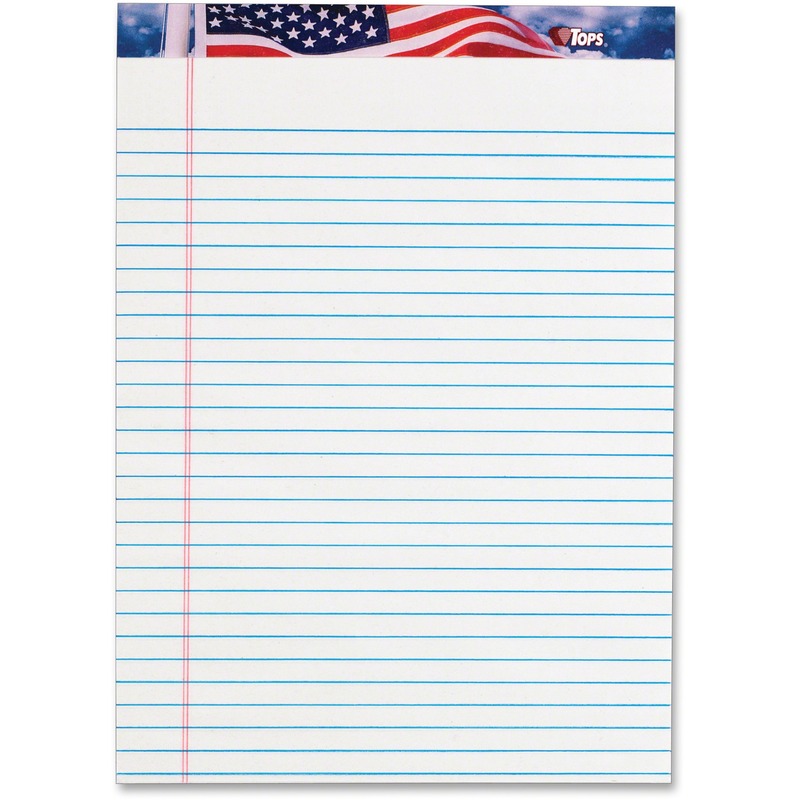 American Pride� writing pad displays the nation's colors on a blue-sky background printed on the binding strip at the top. Letr-Trim� perforation for clean and easy sheet removal. Heavyweight 16-lb. paper resists bleed-through. Pad Type: Notebook; Sheet Size: 5" x 8"; Ruling: Narrow; Number of Sheets per Pad: 50. 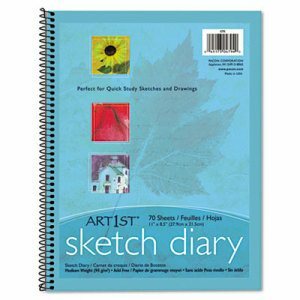 Side spiral-bound sketch pad is ideal for quick-study sketches and drawings. Excellent, heavyweight, acid-free sulphite stock. Ideal for all dry media. 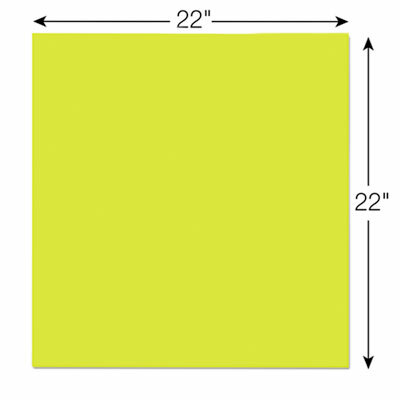 Pad Type: Sketch; Sheet Size: 8 1/2" x 11"; Ruling: Unruled; Number of Sheets per Pad: 70. 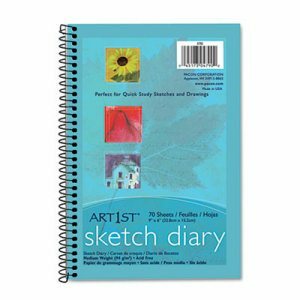 Side spiral-bound sketch pad is ideal for quick-study sketches and drawings. Excellent, heavyweight, acid-free sulphite stock. Ideal for all dry media. Pad Type: Sketch; Sheet Size: 6" x 9"; Ruling: Unruled; Number of Sheets per Pad: 70. Uniform texture and whiteness. 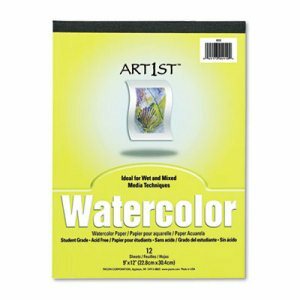 Designed for watercolor and mixed media painting. 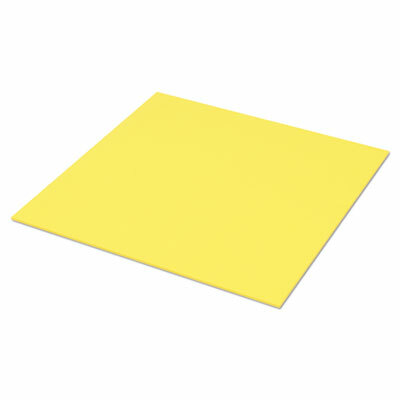 Sheet Size: 9" x 12"; Number of Sheets per Pad: 12; Paper Color(s): White; Paper Weight: 90 lb. Front cover features an inspirational message on a backdrop of watercolor florals. Planner covers 12 months with Julian dates for a full year of weekly and monthly planning. One week per two page spread with an equal amount of ruled planning space for each day Monday � Sunday to record daily plans and tasks. Right hand page of the weekly spread features another positive message to encourage productivity. One month per two page spread has unruled daily blocks, notes space and past/future month reference calendars to manage upcoming events. Monthly spreads are also tabbed for easy planner navigation. Special pages included: holiday list, 3 year reference calendar, event calendar, contacts pages, notes pages and future planning pages for next year. Each page features watercolor florals across the top for a decorative border. Dates are printed in light blue for an extra touch of color. Quality white paper resists ink bleed. Wirebound with gold wire. "Write Your Own Story". Size: 9 1/4 x 11 3/8; Page Color/Theme: Floral/Pink; Appointment Ruling: Open Scheduling; Edition Year: 2017. Front cover features an inspirational message on a backdrop of watercolor florals. Planner covers 12 months with Julian dates for a full year of weekly and monthly planning. One week per two page spread with an equal amount of ruled planning space for each day Monday � Sunday to record daily plans and tasks. Right hand page of the weekly spread features another positive message to encourage productivity. One month per two page spread has unruled daily blocks, notes space and past/future month reference calendars to manage upcoming events. Monthly spreads are also tabbed for easy planner navigation. Special pages included: holiday list, 3 year reference calendar, event calendar, contacts pages, notes pages and future planning pages for next year. Each page features watercolor florals across the top for a decorative border. Dates are printed in light blue for an extra touch of color. Quality white paper resists ink bleed. Wirebound with gold wire. "Make Every Minute Count". Size: 5 3/4 x 8 1/8; Page Color/Theme: Floral/Pink; Appointment Ruling: Open Scheduling; Edition Year: 2017. Front cover features an inspirational message on a backdrop of watercolor florals. Planner covers 12 months with Julian dates for a full year of weekly and monthly planning. One week per two page spread with an equal amount of ruled planning space for each day Monday � Sunday to record daily plans and tasks. Right hand page of the weekly spread features another positive message to encourage productivity. One month per two page spread has unruled daily blocks, notes space and past/future month reference calendars to manage upcoming events. Monthly spreads are also tabbed for easy planner navigation. Special pages included: holiday list, 3 year reference calendar, event calendar, contacts pages, notes pages and future planning pages for next year. Each page features watercolor florals across the top for a decorative border. Dates are printed in light blue for an extra touch of color. Quality white paper resists ink bleed. Wirebound with gold wire. "Live In The Moment". Size: 5 3/8 x 8 1/8; Page Color/Theme: Floral/Blue; Appointment Ruling: Open Scheduling; Edition Year: 2017. Portable and versatile tools to help you capture both your important thoughts and ideas as well as your broader team�s on a large and bright canvas. Three different sizes provide the flexibility to use the specific tool that best meets your needs. Pad Type: Notepad; Sheet Size: 11" x 11"; Ruling: Unruled; Number of Sheets per Pad: 30. Portable and versatile tools to help you capture both your important thoughts and ideas as well as your broader team�s on a large and bright canvas. Three different sizes provide the flexibility to use the specific tool that best meets your needs. Pad Type: Notepad; Sheet Size: 15" x 15"; Ruling: Unruled; Number of Sheets per Pad: 30. Portable and versatile tools to help you capture both your important thoughts and ideas as well as your broader team�s on a large and bright canvas. Three different sizes provide the flexibility to use the specific tool that best meets your needs. 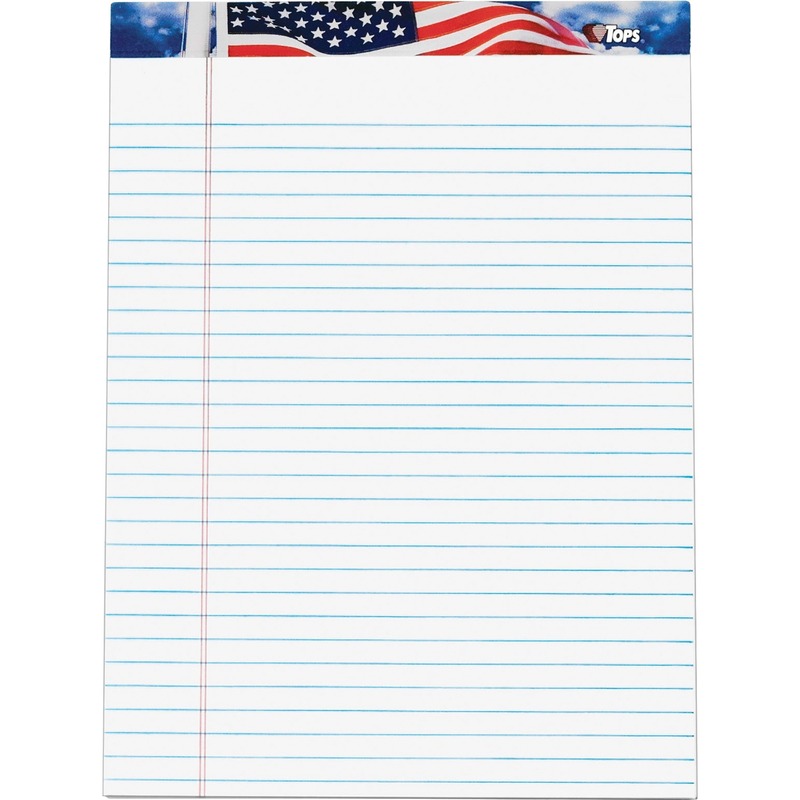 Pad Type: Notepad; Sheet Size: 22" x 22"; Ruling: Unruled; Number of Sheets per Pad: 30. This beautiful assortment includes 8- 3.5 X 5 inch notecards with detailed color illustrations, 4 each of 2 different styles, each blank inside, printed on quality recycled paper, plus envelopes, all packaged in a mylar gift box. This beautiful assortment includes 8- 3.5 X 5 inch notecards with detailed color illustrations, 4 each of two different styles, each blank inside, printed on quality recycled paper, plus envelopes, all packaged in a mylar gift box. Durable hardcover notebook is designed for daily use, with classic black-and-white striped cover and gold accents. Ruled pages keep handwriting neatly aligned and include a date box for added convenience. Each page is perforated for clean and easy removal. Notebook is wirebound with gold twinwire binding to add style. 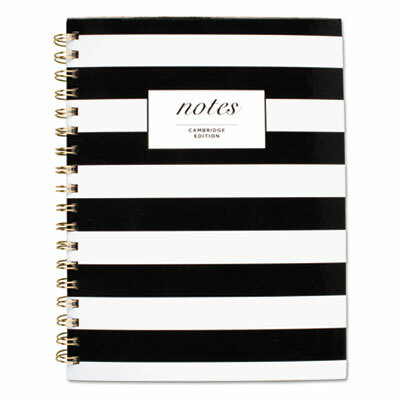 The black-and-white striped notebook is bold and classy with a front cover that features the word �notes" stamped in gold along with the Cambridge� brand name. High quality white paper with black ruling meets all your notetaking needs. Pad Type: Notebook; Sheet Size: 11" x 8 7/8"; Ruling: Legal; Number of Sheets per Pad: 80. Durable hardcover notebook is designed for daily use, with classic black-and-white striped cover and gold accents. Ruled pages keep handwriting neatly aligned and include a date box for added convenience. Each page is perforated for clean and easy removal. Notebook is wirebound with gold twinwire binding to add style. 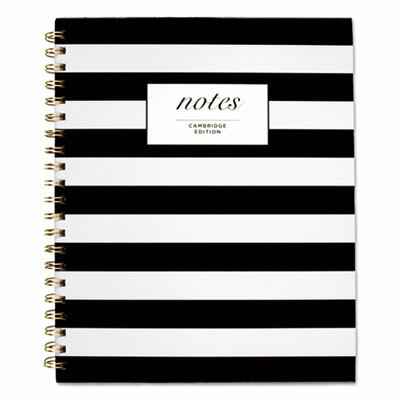 The black-and-white striped notebook is bold and classy with a front cover that features the word �notes" stamped in gold along with the Cambridge� brand name. High quality white paper with black ruling meets all your notetaking needs. Pad Type: Notebook; Sheet Size: 9 1/2" x 7 1/4"; Ruling: Legal; Number of Sheets per Pad: 80.